This is the second schwarzbier I’ve reviewed, and is also a good one. 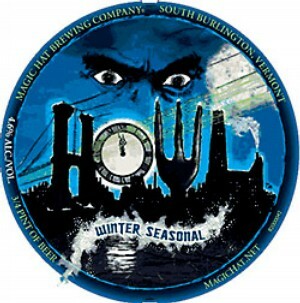 It’s a little late in the season to find Howl, one of Magic Hat’s winter seasonals, but when I came across it, I thought better late than never. Howl has much acclaim, and while it’s not the best schwarzbier out there, it’s still very good. Compared to the other schwarzbier I reviewed, Black Forest, Howl has more stout-like qualities. This doesn’t mean it’s bad, it just means it strays a touch from traditional schawrzbier characteristics. Black Forest is basically a very dark lager, with the same mouthfeel as a lager, but with the flavor of a black beer. Howl is a little creamier, like a stout, and has chocolatey notes, also like a stout. As I said, this doesn’t make the it bad, it’s just worth noting. As a whole, Howl is a wonderful beer. Black in color with a brown head that’s equally creamy and foamy, Howl also has a nice malty aroma. Creaminess greets you from the start and is consistent throughout, leaving no strong residue from the sip, especially at the finish. Howl’s creaminess, however, is very light. Many stouts are light in mouthfeel and still creamy, but Howl’s is even lighter. The lager component is strongest in this quality, because while it’s creamier than most schwarzbiers, it’s lighter than most stouts. It’s an interesting combination, and you notice a very tiny bit of carbonation, like a lager, in each sip, which lightens the mouthfeel even more. This refreshment teams well with the flavor, which is very tasty, consisting mostly of roasted malts and slight chocolate that aren’t overpowering. Howl is a very good beer, and another notable schwarzbier. What sets it back just a touch, for me, is that the flavor gets old after a while. It doesn’t get stale, but it doesn’t keep me interested. Aside from that, it’s an excellent beer, and because it’s one of the most readily-available schwarzbiers, it can easily satisfy any black beer itch. 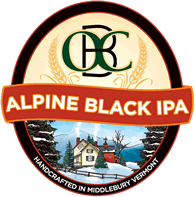 I had only briefly heard of Otter Creek Brewing when I stumbled upon Alpine Black IPA in a bar at the base of Okemo Mountain in Vermont. Among the Magic Hat, Long Trail and Samuel Adams on tap, this was the only choice I’d never had, so of course I had to try it. I didn’t know what to expect because dark takes on IPAs can vary from very good to very bad. What I chose is one of the best dark IPAs I’ve had. For starters, watching this beer being poured was exciting in itself. It’s hard to find an outstanding dark IPA, so the anticipation that this would be a good one was a factor. More importantly, though, was the creamy head that seemed to grow exponentially during the pour and add texture to the black color. Once the head subsided and I was finally able to drink it, the anticipation was well-earned. The best way to describe Alpine Black IPA is a mix of an excellent roasted porter and a good American IPA. When you first start drinking this beer the balance of malt and hops is done so well it’s hard to pick out the flavors. Malt is the overwhelming flavor, yielding roasted and caramel notes that are smooth and creamy, and noticeable for the majority of each sip. These flavors aren’t overpowering, though, and leave room for the sweetness of the hops to shine through at the end of each sip. While malt is the dominant profile, it’s creaminess fuses well with the hops, and in the end you’re left a slight hop aftertaste with the satisfaction of drinking a very nice porter. The flavors might sound to be too contrasting, but they work very well together. The hops really only appear at the end of each sip, and while the malt flavor is good enough on it’s own, the mastery the flavors are mixed with is what makes this so good. Once you get a grasp on how the flavors work, it’s easier to notice the hops throughout each sip. Despite the predominant malt flavors, an underlying sweetness from the hops lightens the beer and then pops through more before the finish. It’s nice to be able to pick out the differing flavors throughout each sip, but I actually prefer the first tastings. It was nice to get a well-flavored porter style for the majority of each sip and transition seamlessly to the hops. If you’re going to try a black IPA, I would put this at the top of your list. I couldn’t decide whether to give this an 8/10 or 9/10, and decided to give it an 8 because I feel the need to have it a few more times to fully figure it out. This doesn’t take away from how good it is, though, and to me is the benchmark of the black IPA style. My old roommate used to bring Long Trail’s Blackbeary Wheat back to Syracuse after going home to Vermont for breaks. It was always something to look forward to and was a nice beer to help change the season from dreary and cold to sunny and warm. I really liked it, but it did have a novelty to it because we could only get it after breaks. I was anxious to give it a go many years removed from the original tasting, so I picked up a six-pack last weekend. While not outstanding nor terrible, Blackbeary Wheat is a very respectable fruit beer. Upon pouring into a glass, you first notice two things: the aroma and color. The first thing that strikes you is the bouquet. It’s not overwhelmingly sweet as to turn you off, but enough to make you thirsty. Dark berry notes are less intense than lighter ones, and thus more inviting. The second thing is the extremely light, completely clear color, which is as light as an American light beer (the head is also reminiscent). Above the curiously light color, though, the aroma is what grabs you most. Upon drinking, you’re met with a remarkably light mouthfeel that feels like you’re drinking a light beer. The weight, or lack thereof, is consistent through the finish and crisp the whole way. The blackberry flavor meets you immediately and offers a different type of fruit not commonly found in fruit beers. It’s very nice and has a subdued sweetness compared to other berry mixtures that are more common. The fruit sweetness starts lighter and builds slightly as the sip progresses, reaching it’s peak at the finish, although it’s not too high of a summit. The end of the sip has just a bit more sweetness than the rest of the sip, and the fruit flavor finishes off nicely without much aftertaste. While not an outstanding beer, Blackbeary Wheat is one of my top choices for fruit beers. One reason I prefer Blackbeary Wheat to others is that it’s a beer first and the fruit comes second. Far too often fruit beers hit you too hard with sweetness, leaving you with a beer that tastes like it’s half juice-half beer. In this case, the beer is a vehicle for the fruit, not the reverse. Another quality this beer boasts is the sweetness doesn’t accumulate to the point that it makes you full. Because it’s so light and the sweetness isn’t overpowering, you’re not left with a strong aftertaste that will turn you off to having another. It’s also very refreshing, and with 4.0% ABV, is very sessionable (although I dislike the term). Compared with other American fruit styles, Blackbeary Wheat more closely resembles a lambic, the Belgian farmhouse style. Despite it’s attributes, for a wheat beer it’s not very wheat-like. There’s no cloudiness or creaminess to it, and a little extra from the wheat would fill this beer out nicely. If you really like fruit beers, or are still searching for the right one, you’ll like Blackbeary Wheat. A friend of mine brought this back from a trip to Boston not too long ago. I’d never heard of it, but when I was told it was an IPA, of course I was interested. When I looked into it a little more, I saw it was part of Magic Hat’s IPA On Tour series. Throughout the year the brewery creates four different IPAs to see what variations can be made and how IPAs can be tweaked. While I’ve known about Magic Hat for a while, this reaffirms that it’s my kind of brewery! Encore is a hybrid of an American wheat beer and a traditional American IPA. It’s not uncommon for breweries to blend unique ingredients into American IPAs, but I wasn’t sure if I’d ever seen the components of a wheat ale used. My main concern was whether the wheat would add a creaminess and subtle sweetness to complement the hops, or give the IPA a stale, lingering wheat flavor. Luckily, the wheat is used masterfully and makes this IPA very complex. A slight fruity smell strikes you as you’re about to take a sip, reminding you that the IPA portion of this beer is the main focus. Meanwhile, the wheat adds a nice cloudiness to keep you cognizant of the other ingredients. Once you take a sip, everything really comes together. With a pretty light body, hops shine as the main flavor. There’s about as much hops as you’d find in a very flavorful IPA, and even some double IPAs, but the lightness of the beer makes it very easy to drink and not overpowering. While the flavor is there, it doesn’t deliver as much of a punch as you might expect from a beer hopped at this level. As the sip progresses, the wheat really starts to emerge. The initial burst of hops matures to a sweet citrusy flavor and combines with the wheat to give the sensation of a good, fruited wheat beer. The creaminess the wheat provides joins the citrus from the hops to yield a flavor reminiscent of a nice summer, fruit-flavored wheat beer. The wheat also makes itself known in the finish. By the end of each sip you’re left with a sweet hoppy aftertaste you’d expect from a well-flavored IPA, but it’s diluted enough from the creaminess of the wheat to make it very manageable and smooth. It’s never too much and fades rather quickly, leaving your palate ready for the next sip. Each time is smooth from start to finish. The only thing holding it back is that, after a while, a slight aftertaste can accumulate. Aside from that, this beer is just about perfect. This is a fantastic IPA. It’s a great example of what can be done with the style and how complex it can be. IPAs are more than just hops hops hops. While those can be wonderful if done correctly, the inclusion of a seemingly common and unrelated ingredient can change how the beer is structured. 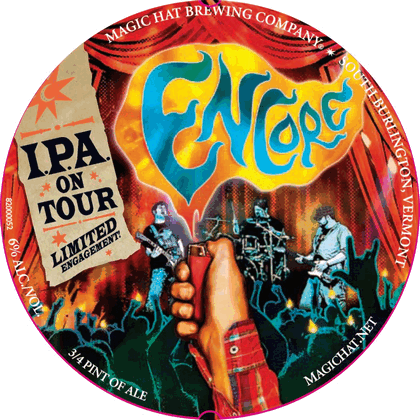 I hope Magic Hat makes Encore again, and hopefully it will eventually be made year-round. Until then, if you see it, get it.